I'm not sure if it's the weather or the time of year, or if I'm more tired than usual -- but I know that I've been crabbier than usual, and so have my kids. 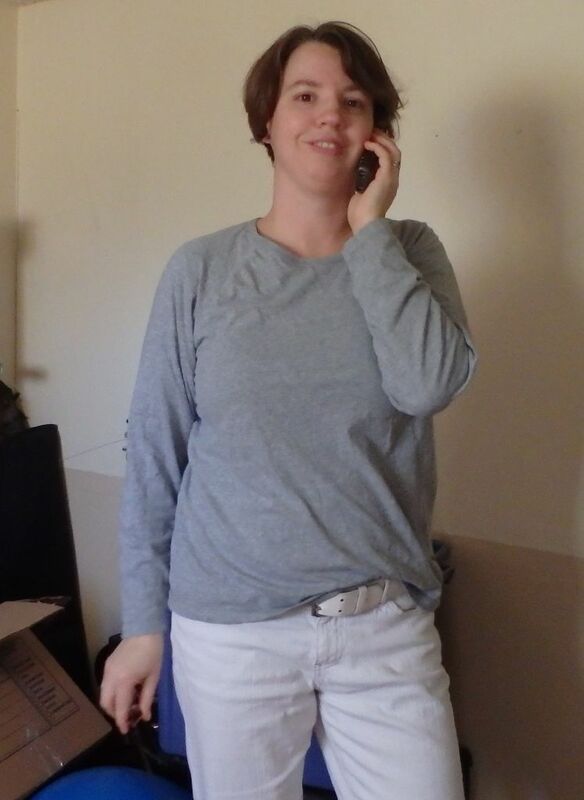 So, while we all try to minimize our picking on each other, I've still gotten dressed, albeit with less thought and skill than usual. #1 - all black with a teal cardi - (It's lighter and brighter than in the pic). This combo was "prettier" than I'm used to, and judging from the reactions of people around me, it was a miss. I didn't really mind it, but didn't especially feel like it was me. #2 is the same day - with the addition of my Navy Pea coat. I remembered that I had this a few days ago (it's from college days), and pulled it out to discover that it fits even better now than it did in college. I liked wearing it. #4 is a new pair of fake cons from the same thrifting trip. I have a real knack for picking up mis-matched shoes. At least on this pair, it's just the laces. #5-7 are my gray/white outfit with the shoes in #4. I wore it with the scarf most of the day. #8 is what I'm wearing today. I was looking for something that would be a fun color combo with the camo, but I don't think I nailed it. I kind of love that velour sweatshirt with the colorblocking. Very fun. The white out and black/blue outfits look great too. I think 8 has ALGO to my eye. Perhaps switching the shoes to something more subdued would help. These are all great casual outfits though--you've done good! I like the sweatshirt a lot! I like the sweatshirt, too! Yay for bold colour blocking! I am sorry you and your kids are feeling the grumps. I have been similar. We had a bit of a family meltdown this morning in fact. Ah well. Back at it. As Beth Ann says, we are halfway through the dark. Thank heavens. And it's also good to know that ours isn't the only house that's been taken over by ogres! Halfway through the dark, halfway through the dark! Yeah, we've been feeling. Here too, especially as DH suffers from SAD. And, as an accountant, we can't take a vacation this time of year. Still, you look streamlined and put together. A huge feat when it is this cold! I'm a sucker for scarves and neck-things so I'm partial to #6-7. And I love the red shoes in #8. I hope the crabbiness goes away soon. Probably some sunshine is needed. Aww: I hate those days, when the whole household seems on edge. Hope it passes soon! I *love* your peacoat, how neat that you just pulled it out & it fits so well. :) You tied your scarf in a great way in the white out outfit. Very cool! You may feel crabby, but you still look delightful and huggable, Amy. Absolutely loving #6 and #7. Killer. And how fun is that '80s sweatshirt. Wow. I want one too. #1 what a great smile you have! Also, your pants (jeans?) look super on you! #2 such an elegant peacoat; lucky that you still have it. #3 I had a fun flashback to a velour top I sewed for a class in the 80's. #6 Grey complements your complexion beautifully. Re the crabbies... there's not enough light/sun to keep us in a good mood these days. It's a hard time of year. But the days are already getting a little longer. I actually really like outfit #1. But I do know that it is indeed "prettier" than you are used to, so if it doesn't feel like you, just live and learn and move on. :^) Maybe save the outfit for a more formal function. I think that the mismatched shoelaces on the shoes looks intentional...I kind of like it. :^) And I like the colorblocked sweatshirt as well. I like the scarf with the white and gray outfit, but I feel like maybe the way the scarf is draped makes it a little overwhelming on you. I have a small face and frame and am often swamped in scarves, so sometimes I have to try various ways of tying them until they look balanced and "fit in" with the rest of my outfit. I found a lot of ways to tie scarves on scarves.net--they have what they call their Scarf Master List. I tried to do a new knot per week so as to increase my own repertoire, but alas, after a few weeks I got too busy. Oh well! I so get this. See, this is why parents love to send their kids back to school after break --- then the teachers have to handle the post-holiday crash! Of course, on the plus side, homeschoolers have the option to listen to their bodies and start a little later, take more frequent breaks, etc. That's what we've been doing this week. My kids are old enough that we can actually have conversation about managing the post-holiday doldrums, which helps a little bit. Fortunately, I have a week to get the kids going before I go back the the University, which is a big blessing! Now, I'm also a big fan of 6/7 -- love the new shoes. I think the blue cropped sweater in #1 needs a little more structure to work as a topper for a black look --- perhaps it would work over a spring dress. I love the trousers and booties -- they're fab. In the camo/red look, the texture of the knit along with the patterned pants is an ALGO look which works but is more hectic than most of your looks. You could sub out either the booties or the sweater, or pair those two items with plain green trousers. I'm also feeling the winter crabbies. I think mid-January may be the most depressing time of the entire year. But the '80s sweatshirt makes me feel a little less crabby just looking at it! I also think the teal in #1 is a gorgeous shade on you, and really love the gray/white outfit with the scarf. I love the peacoat on you, would have grabbed that velour sweatshirt in a second and you look great in the light colors. January is the hardest month for me too. I love the 80's sweatshirt! And that scarf in #6 and #7 is super-fab. Thank you so much for all your encouragement! You have really made my day so much better. Beth Ann - we too have been sleeping in - the whole idea of the kids being up and out the door by 6:30am (when the school bus comes by our house) kinda terrifies me. I don't know how families (nor teachers) do it - especially this time of year. Loving 4-7! Hope you and kids are feeling more cheery soon. Number 3 is stunner! I love the sweatshirt!!! I have been feeling crabby for what feels forever now! LOL! Must be the weather! Hope you feel better soon! Let us just call it weather related attitude (WRA). You look great no maker what the attitude is. You look great in all of these outfits. I like the sweatshirt, especially the way you've styled it so simply with a pair of great jeans. Love the white/gray outfit with the scarf and those fantastic faux-cons--super outfit. I like the red-black-camo outfit too. I agree with kellygirl that there's a lot going on, and maybe black shoes--or perhaps the camo sneakers?--would add a little subtlety, but it's a fun look the way you've done it. You look terrific in that teal sweater--what a good color for you. Hope the sun comes along and cheers you all up. It felt like Spring here in Seattle today, with a welcome mild, sunny day! I can see from your photos that you have some punk attitude, amiable! I really like outfit #8! I love the red/green colour combo, I love the textured knit over the long sleeve tee, and the camo pants are tough! I can see this looking working well with Doc Marten lace up boots!!! 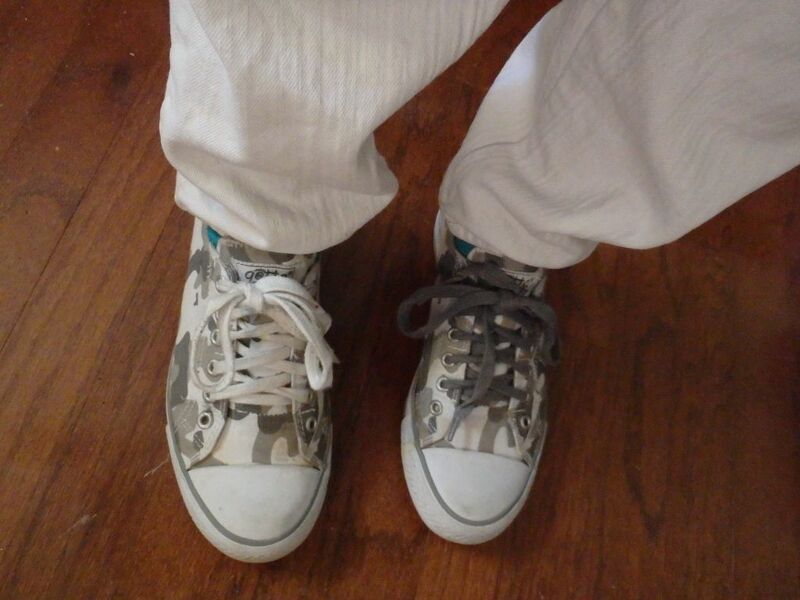 I also really like the camo sneakers with the white pants and grey long sleeve tee- very skater girl! Hmmmm- cogitating.... If Doc Marten romper stomper style eyelet boots are a tad too paramilitary for you..... how about black, flat, knee high boots? ?